1. William Smith b about 1795 Sullivan Co TN d 15 Feb, 1875 Floyd Co KY; m. 20 Apr 1816 Floyd Co KY to Millie "Nellie" Combs b 20 Apr 1802 d 21 May 1876; d/o John "Soldier John" Combs and Margaret "Biddy" Nantz. 3. Nancy Julia Smith b about 1802 KY; m. (1) John P Martin. Nancy Julia Smith m. 25 Dec 1821 Perry Co Kentucky to (2) George Combs b about 1798 TN; s/o Henry Harrison Combs and Rachel Clemmons or Clements. 4. Thomas Smith b 4 Aug 1804 Sullivan, TN d 28 Feb 1881 Breathitt Co KY; m. 25 Jul 1826 Perry Co KY to Sarah Clemmons b 1804 d after 1834 Breathitt Co KY; d/o Francis William Clemmons and Rebecca Fleming. 5. 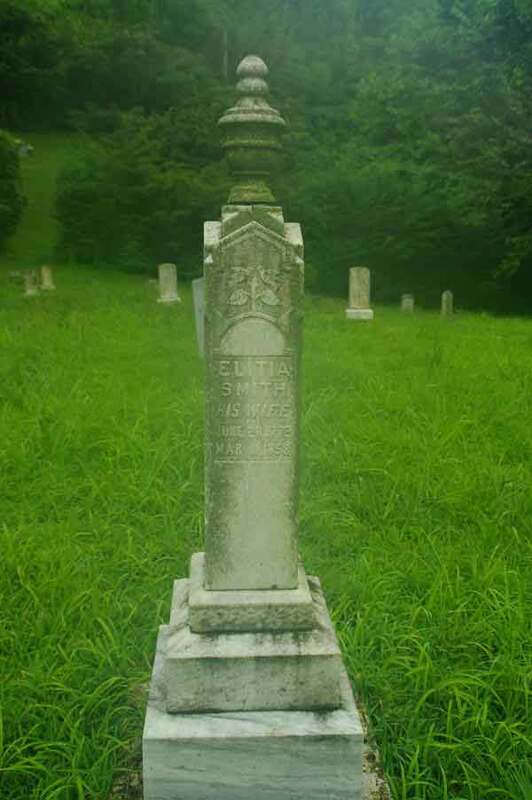 James Smith b 1805 TN; m. 25 Nov 1822 Perry Co KY to Rhoda Owens b 1804 VA; d/o Reece Owens and Virginia Lee. 6. Nicholas Smith b 1806 Clay Co KY d 1870; m. 3 Aug 1830 Perry Co KY to Nancy Arta Johnson b abt 1808 KY; d/o Thomas Johnson and Philadelphia Delphia Carter. ; d/o Thomas Johnson Jr and Delphia Carter. 7. Samuel Smith b 5 Jan 1809 Clay Co KY d 2 Apr 1863 Perry Co KY; m. 6 Nov 1832 Perry Co KY to Nancy Jones b about 1812. 8. Kesiah "Kizzie" Smith b 1812 Clay Co KY d 1892; m. 8 Aug 1830 Perry Co KY to Thomas Grigsby Ritchie b 1805 Russell Co VA d 1879 Clear Creek, Perry Co KY; s/o Alexander Crockett Ritchie and Susan Elizabeth "Betsy" Grigsby. 9. Mary "Polly" Smith b 13 Feb 1814 Clay Co KY d 28 Jun 1900; m. 1832 to Zachariah "Ball Creek Zack" Fugate b 1817 d 1864; s/o Martin Fugate and Mary Ritchie. 10. Lorenzo Dow "Anze" Smith b 16 Nov 1816 Clay Co KY d 8 Dec 1903 Knott Co KY; m. 12 Jul 1838 Knott Co KY to 1st Sarah Fugate; d/o Jonathon Fugate. Lorenzo Dow "Anse" Smith m. 7 Oct 1881 to (2nd) Frankie Stacy. 11. 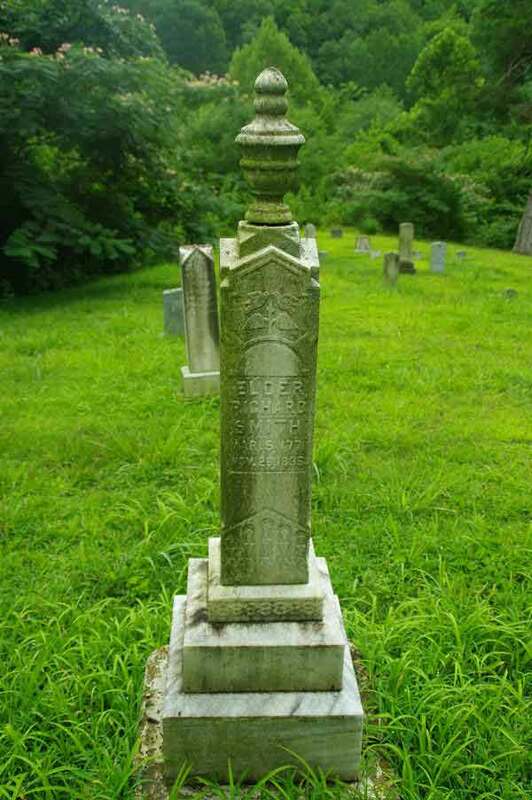 Joshua Smith b 24 Oct 1818 Clay Co KY d 11 Aug 1889 Ary, Perry Co. KY; buried Old Smith Graveyard Ary KY; m. 24 Oct 1850 Perry Co KY to Jemima Amy Holliday b 14 Feb 1830 VA d 12 Jul 1874 Perry Co KY buried Old Smith Graveyard Ary KY; d/o John H D Holliday and Allie Justice. 12. Isaac Smith b 18 Dec 1820 d 21 May 1878; m. 12 Jan 1843 Perry Co KY to Cynthia "Sithy" Stacy b 1825 KY d 1878. 13. Elizabeth "Betsy" Smith b 1 Apr 1822; m. 8 Oct 1840 Perry Co KY to Martin Fugate b 1820 TN d 1880; s/o Levi Fugate and Haney Noble. 14. Cynthia Smith b 1826 KY d 3 Feb 1892 Perry Co KY; m. 7 Mar 1844 Perry Co KY to John Stacy b 1824 KY d 12 Mar 1912 Perry Co KY; s/o James Downey Stacy and Mary Polly (Combs) Owens. Excerpted from Andrew Combs, John S. Combs, and William M. Combs' entries in Dr. J.J. Dickey's Diary. Roll3, pg. 2264, 2269-70, 2405 "Richard Smith. Great grandfather of "Bad" Tom Smith. Came to Kentucky with "my uncles" and settled on Troublesome. Richard married Nancy Combs, my aunt. He is a Baptist preacher. He would drink liquor and fight. He whipped a bully and got his nose and ear bit off. He was a blacksmith. He could not be whipped." "Rev" Richard Smith married Malissie Combs." The Following Information Comes From Darrell Smith's Website Regarding the early life of Rev Richard Smith and his wife, Aletia Combs. Rev. Richard Smith b Mar 6, 1771 died Nov 28, 1836. He was a primitive Baptist Preacher for 45 years. Sam Smith family has his bible with Smith Births and Death records dating back to 1816. He (Rev Richard Smith) was said to have delivered hell fire sermons and after the service was over would be seen sneaking out back and taking a swig of his whiskey. According to County Court Records of Owsley Co. Ky. His brother John was appointed guardianship of him there early. He is believed to have first lived in Owsley Co. before going to Perry Co. An estate auction in Owsley shows that Richard Smith purchased the Family Bible of John's. Richard was married to Nancy Alicia Combs, daughter of Nicholas "Danger Nick" Combs. Nancy Aletia Combs b Jun 20,1772 d Mar 11,1858 Ary, Kentucky. Rev. Richard Smith was the Great Grandfather of Bad Tom Smith who terrorized Breathitt and Letcher Co.'s. Richard and Alicia had 14 children. Richard Smith and his brother John Smith were the only surviving children of William Smith and Betty "Eunice" Ritchie. After the death of their father, William Smith, Richard Smith and John Smith moved to the unsettled land of Kentucky. They left their mother, Betty "Eunice" Ritchie, VA to handle the plantations which were left by their father. Some say Richard Smith came to Perry Co. Ky by way of Pound Gap, about 1792. Richard Smith first settled Lotts Creek (Kentucky) area before moving to Pigeon Roost on Troublesome Creek at Ary (Kentucky). According to Henry P. Scalf in his book, "Kentucky, Last Frontier," Richard Smith owned 38.577 acres of land in 1796 through Eastern Land Titles.